Formed in early 2014, the Mkizwana Ensemble comprises of four gentlemen who have been musicians and friends for several years. Named after the musical director, Viwe Mkizwana, the band performs a variety of original compositions, which are arranged by the collective. Through the combination of keyboard, double bass, trumpet, alto and tenor saxophones the ensemble produces a unique sound and most importantly – Xhosa and other African genres. The ensemble’s organic style of creating and performing aids the adaptability of the young collective. The strong friendship between Viwe (double bass), Jack (trumpet), Malusi (alto saxophone), Africa (tenor saxophone) and Thapelo (keyboard) feeds into the sentimentality and balance of the 15 song repertoire which comprises of tunes such as Jack’s “She was good” and Viwe’s dedication to his late brother “Zinhle”. 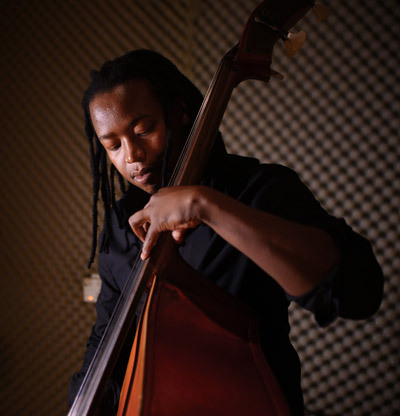 Having met at the Tshwane University of Technology, the collective has a variety of training ranging from jazz to popular music in addition to various qualifications from the Trinity Guildhall and the Royal School of London. Vast travel experience across African, Asian and European regions has also boosted the band’s understanding and creation of music – the craft which feeds the group’s collective spiritual journey. In their brief period of being active, the ensemble has performed a variety of gigs both public and private. They also had the pleasure of gracing the Moratele Park festival addition to performing at the Standard Bank Joy of Jazz Festival which bears testament to the ensemble’s passion for performing. In addition to sharing the stage with legends, the Mkizwana Ensemble has also been interviewed by various radio stations. Having been placed 3rd in the Puisano Competition in Gauteng, the ensemble has grand plans for the future. With an album recording and various live performances, Mkizwana Ensemble seems set to attain their goal of reviving jazz and making it more accessible to the youth. Understanding the public’s responsiveness to social media, the ensemble has a Facebook Like Page as well as a Soundcloud account named after the band which allows audiences to keep up to date with the band’s progress and to hear some of the recorded compositions.